So, to continue this series of conversations, here is Kelly Richardson, director of Without A Net. Synopsis: Djeferson, Bárbara, Rayana, and Platini live in a drug controlled slum of Rio de Janeiro. Their families are struggling, their homes are physically unstable, and everyone they know has dropped out of school. When a big-top circus tent suddenly appears in a nearby parking lot, they decide to take a chance. They learn trapeze, acrobatics, juggling, and contortion, and then audition for the end-of-year show, rehearse, and prepare for the curtains to part on opening night. Along the way, Without A Net explores the connections between risk, desire, poverty, and circus and celebrates the perseverance and resilience of youth in the face of tremendous odds. IDA: Last week Without A Net was at DocuWeeks in Los Angeles. How was that? reviews—it was recommended by the LA Weekly and the Village Voice, and written up by the Los Angeles Times and LA Latino Weekly and several others. So all in all, LA DocuWeeks was great! IDA: I understand that you studied dance and are trained in acrobatics. 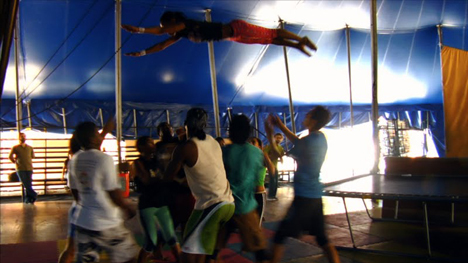 So how does a circus performer get started in documentary filmmaking? great to learn about the culture through that window. initial seed that later grew into the documentary. IDA: But how did you pick up that camera for the first time? How did you understand how to edit and put a story together visually—a lot of those various skills that people go to school for. How did you get started with that? had before returning to Brazil to make the film. IDA: The inspiration for making the film seems pretty straightforward since the subject is something in which you are so deeply entrenched. What was it about this particular circus in Rio that made you want to tell their story? IDA: Outside of Djeferson, did you always know that you wanted your story to focus on those other three individuals also, or did you follow a lot of them and then just edit it down so that we only heard these four stories? little bit and see if this was something that they wanted to do. come to their homes and welcomed that. IDA: I know that resources were probably pretty limited while you were over there. A lot of those kids have to deal with family issues and with just getting food. On top of those things, what were some of the challenges you encountered when making this film? What were some of the things you did to overcome those challenges? been to school. He's illiterate. IDA:You were in the unique position of not only knowing a lot about circus but having been there yourself. So did you decide to step in and help her a little bit? How did you navigate that? realities are very different." Sometimes that was hard. I said something like that. IDA: You mentioned earlier that it was sort of hard sometimes to listen to these stories especially with these subjects knowing that they are going to be told to audiences who they might not ever get to interact with. As you've screened Without A Net in different screenings and countries and especially last week in Los Angeles, how have audiences reacted to the film? KR: We've had really good responses from audience and critics. IDA: Oh yeah, that made me really anxious. I was thinking, "They don't know what's under the water!" IDA: Have the four main characters or anyone else involved with the circus seen the film? have seen most of the film. IDA: So now that this film is done and you've entered it into DocuWeeks, have you had a chance to look beyond that at what's coming next? Do you want to make another film? Are you thinking about going back into doing circus? have the people in Without A Net in my life. Without A Net will be screening August 10 through 16 at Laemmle NoHo 7 in Los Angeles, and August 17 through the 23 at IFC Center in New York.